Carrying your newborn home from the hospital triggers an overwhelming surge of emotions. You’ve created a new life, and there is nothing more magical than that. Your days will now be filled with your new child – making sure they are healthy, happy and receive all the love that you have to offer.However, you don’t have to sacrifice yourself and your body during this new time. It’s important to make sure you stay happy and healthy, too. Take time to consider yourself by staying active and eating healthy foods that will help you be a better mother and stay grounded. Even with diet and exercise, you may find it difficult to get back to your pre-baby body. 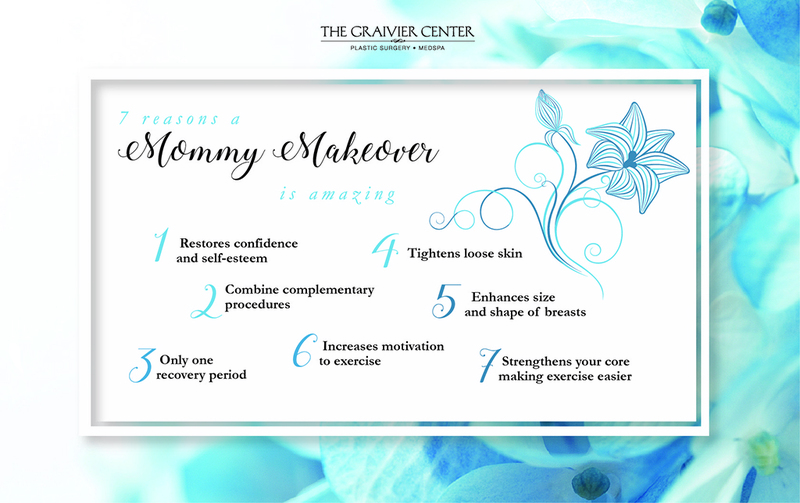 The Mommy Makeover, or as we at The Graivier Center like to call it, the Mid-Life Refresh, is a combination of surgical cosmetic procedures designed to reverse the physical changes associated with childbearing and aging. By combining procedures, you can achieve complementary or enhanced results, receive a lower cost and experience only one recovery period. Ready to schedule your consultation and get back to your pre-baby body? Call us today at 770-772-0695 to get started.